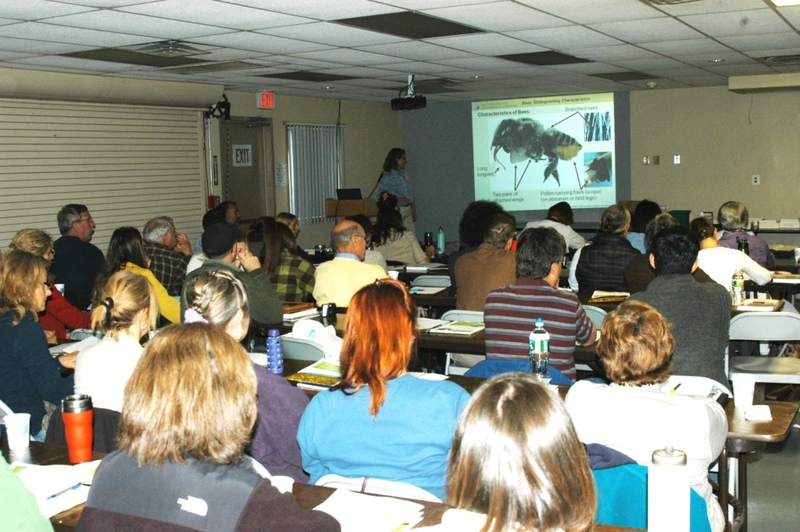 Share the post "Pollinator Conservation Planning Short Course"
Identify approaches to increase and enhance pollinator diversity on the land. Knowledge of current best management practices that minimize land-use impacts on pollinators. Understand the economics of insect-pollinated crops and the effects of pollinator decline. Ability to make recommendations to farmers and land managers that conserve pollinators. Ability to design and implement habitat improvements, such as native plant restoration and nest site enhancements. Additional funding was provided by the USDA Northeast Sustainable Agricultural Research and Education (SARE) program, the CS Fund, Disney Worldwide Conservation Fund, Sarah K. de Coizart Article TENTH Perpetual Charitable Trust, Turner Foundation, Whole Systems Foundation, and Xerces Society members. Support was also provided by the Cape-Atlantic Conservation District and the North Jersey Resource Conservation & Development. Rachael Winfree makes her presentation during the short course.